The appeal of a holiday in a luxurious and exotic location is there for all of us, but until recently, a break in a truly exotic place was not an affordable option. Far-flung places remained reachable only by the very wealthy until the arrival of cheap air travel, which we are fortunate to enjoy access to these days, so a trip to somewhere unique and exciting is now a reality, even for those on a limited budget. You may want to visit Asia, and explore countries that have only recently become open to tourists, and this is an exciting and enticing option. However, for many people – after a long season of full days at work – the appeal of lying on a beach in an exotic location, with nothing to worry about and no demands on your time, is the perfect holiday. That’s why we recommend you check out Maui beachfront rentals, for the best accommodation and holiday locations in Hawaii, if not the world. Perhaps the most beautiful of the Hawaiian Islands, Maui is a place where you really can get away from it all, and you will be surprised how affordable it can be to rent a beachfront house or villa for a family holiday or romantic break for a couple. There are many fine hotels on Maui, and you could choose to stay in one of these are be treated to excellent service throughout. However, wouldn’t it be better to have your own home from home for your vacation, somewhere you don’t have to suffer the obvious restrictions that come with staying in a hotel? With a rental, you can come and go as you please, choose to eat when you want, take advantage of the luxurious and excellent furnishings and facilities, take a dip in the pool, or even cook your meals outside in your own private external area. Of course, all of this will be too expensive for you, is what you are thinking. It’s a fair thought, but – for example – check out Condominium 105, one of the fine examples of accommodation at the exclusive Puunoa Beach Estate, a wonderful gated community in one of the finest locations on the island. Perfect for a family of four, this amazing residence features all the shared facilities you would get with a good hotel, but with the added convenience of your own private residence, complete with private outdoor area, excellent views, and the beach right on your doorstep. Have a look at the rates, and we are sure you will be amazed that the price is comparable to one of the finest hotels on Maui. For added exclusivity, you could choose Sunny Surf, a quite beautiful house in the prime buy clonazepam no prescription needed location of Kihei. Located on one of the most amazing beaches on Maui – and many say in the world – this stunning house sleeps up to six, and is set in its own glorious gardens with utterly sensational features. An excellent outdoor area features a full barbecue set up, and we strongly recommend you check out the local markets for freshly caught seafood to cook outdoors in the warm evening. Indoors, you get everything you need from your vacation accommodation, with luxury furnishings and all facilities, so you can enjoy a lovely, comfortable night’s sleep, or while away the evening as you wish. After all, relaxation is what Maui is all about, and it doesn’t come much better than at this luxury house on the beach. You can choose to spend your days whiling away the hours relaxing on the beach, or you might want to take a trip to the nearest town, explore the markets and shops, and stop in a café for a snack or a coffee. Maui is no exception when it comes to the legendary Hawaiian friendly welcome, and the people here could not be more helpful and welcoming. You might want to check out one of the many restaurants – be careful to look down the side streets for hidden gems such as the very wonderful Eskimo Candy, in Kihei. It’s off the beaten path but well worth a visit, with just a handful of tables inside and out, but the food is utterly wonderful and as authentic as it gets. Pita Paradise, in Wailea, is another great place to eat, and can be found easily. It’s also surprisingly cheap, so a great place to take the family. Maui is a wonderful island to get out and explore, too, with the volcanoes being an interesting attraction. Unlike most such features, Hawaiian volcanoes are easily accessible, and you can take guided tours to explore them fully – something the kids will love a lot! You can also enjoy snorkelling or diving off the island, as there are many fine coral reefs in the clear waters to enjoy, and the undersea wildlife can be quite spectacular. However you choose to spend your time on Maui, you can be sure that you will thoroughly enjoy your stay, and we are quite sure that, once you have experienced this small island with a very big heart, you will want to return time and time again. 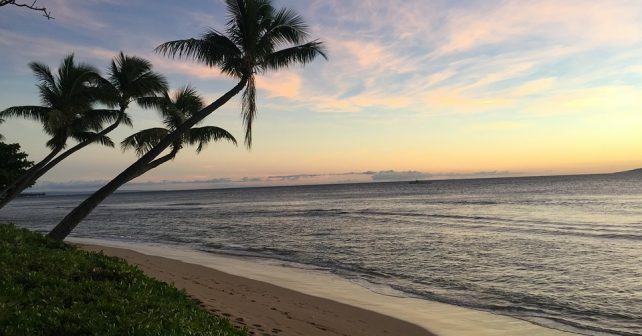 We recommend you take the time to have a look at the many beachfront rentals on Maui, as there is a great deal of variety in terms of location and accommodation, and book a family holiday to remember in one of the most beautiful places of all.